Atlantic City evacuated residents while casinos and other businesses closed as a precaution. The city was spared the brunt of the storm, but emotional damage remains. “It’s a shame because it felt like we had some momentum building before Sandy hit,” Tropicana Atlantic City President Tony Rodio said in an interview in late April. Rodio has spent 30 of his 33 years in the gaming industry working in Atlantic City. In April, figures released by the Division of Gaming Enforcement showed Atlantic City’s 12 casinos collected $228.5 million in gaming revenues, a decline of 12.1 percent from a year ago. Gaming revenues have declined in 54 of the past 56 months. In 2006, gaming revenues were an all-time high of $5.2 billion. The 2012 total of $3.05 billion was the lowest figure since Atlantic City casinos cracked the $3 billion mark in 1992. In the first four months of 2013, gaming revenues are down 12 percent. But that’s not the whole story, Atlantic City casino and tourism leaders say. Nongaming indicators from 2012 showed upticks in luxury and sales tax collections. The hotels’ overall nongaming revenues grew almost 3 percent. “For someone who just wants a night of gambling, it’s now in their backyard,” said Caesars Atlantic City General Manager Kevin Ortzman, who also oversees Bally’s Atlantic City and the Showboat. The Atlantic City Alliance, which was created through Christie’s reform package, has the task of marketing the casino industry. The agency is housed in Boardwalk Hall, an event arena built in 1929 and supplanted in 1997 by the Atlantic City Convention Center. The Alliance’s $30 million annual budget is funded by the casinos, but that doesn’t mean it pitches only gaming. Last year’s advertising campaign — “Do AC” — didn’t display one gaming moment, and the current campaign has just a smattering of casino shots. Cartmell also said the city needs to copy Las Vegas in drawing visitors through nongaming amenities. Many of the same restaurants operated by celebrity chefs and high-end eateries found on the Strip are also on the Boardwalk and the Marina. When Jimmy Buffett’s Margaritaville opens Memorial Day at Resorts Atlantic City, the restaurant will be just down the Boardwalk from the Hard Rock Cafe in the Trump Taj Mahal and the House of Blues in the Showboat. Many of the casinos offer elaborate spas, nightclubs and shopping. The Walk at Atlantic City is an outdoor mall operated by Tanger Outlets with more than 100 shops and restaurants on six square blocks between the convention center and the Boardwalk. A Bass Pro Shops is expect to open near the mall by next year. During the summer months, there is also the Boardwalk and the beach. For the first time, Atlantic City last year marketed its nongaming elements as a whole. And, casino leaders are working together to support the market. Borgata President Tom Balance said the collaborative efforts from the Alliance, the Casino Reinvestment Development Authority, the governor’s office and casino operators are all working to stimulate the industry. And, there is optimism. Many casino operators said the gaming industry’s partnership with the state is working. “It’s amazing. We have double-digit declines, but everyone has a sense that there are a lot of positives and things are moving in the right direction,” Rodio said. Weekends are busy in Atlantic City, but filling midweek is crucial. Convention and meetings business is viewed as one component of a midweek strategy. The convention center has 486,000 square feet of space, including 40 meeting rooms. The hotels have their own conference and meeting facilities. Only Revel, with a 100,000-square-foot space, offers much for conventions. As a comparison, Las Vegas has massive convention facilities, including the 2.2 million-square-foot Las Vegas Convention Center, 1.6 million square feet at the Mandalay Bay, and the 1.2 million-square-foot Sands Expo and Convention Center. Multiple Strip resorts have convention and meeting facilities ranging from 50,000 to 300,000 square feet. Vasser said plans by Harrah’s Atlantic City, which is in the Marina district, to add a 150,000-square-foot conference center would help further the convention authority’s goal of growing corporate meeting business. Harrah’s General Manager John Smith said Caesars Entertainment is still “getting everything locked down” for the conference center, which might not open until 2015. Smith said boosting midweek meetings would help offset Atlantic City’s loss of business to casinos in other states. 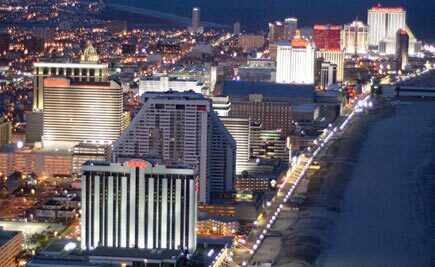 Caesars operates one-third of Atlantic City’s casino market. The company also owns Harrah’s Philadelphia, about an hourlong drive to the west. Company officials plan to open the Horseshoe Baltimore in 2015, and they are bidding for a casino license in Boston. Smith and Ortzman said the company is dedicated to maintaining the Atlantic City market, even as it increases competition from casinos in feeder markets. The focus over the past 18 months has been building and promoting Atlantic City’s nongaming attractions, but developments looming on the horizon could give the Boardwalk a competitive edge: Internet gaming and sports betting. In February, Christie signed online gaming legislation that allows anyone to open an account but limits the wagering activities to computers and mobile devices in New Jersey, and only Atlantic City casinos can operate the websites. Regulations are being drafted and gaming authorities expect the review process to start by December with Internet gaming to launch next year. Not surprisingly, all Atlantic City casino operators are exploring their options. Boyd Gaming Chief Executive Officer Keith Smith said last month that Borgata “intends” to be the first Atlantic City casino to offer online gambling. Earlier this year, Borgata — Atlantic City’s gaming market leader since its 2003 opening — became the first in the market to launch in-room wagering, allowing bets on a slot machine game and on four versions of video poker. Balance said revenues “aren’t going to be of any consequence on the income statement,” but that’s not the point. The other factor is sports wagering. New Jersey voters last year overwhelmingly backed sports betting, which is now allowed under state law in Atlantic City’s 12 casinos and the state’s four horse tracks. A federal judge ruled against New Jersey when major professional sports leagues and the NCAA sued to maintain a 1992 federal law that restricts sports betting to Nevada, Oregon, Montana and Delaware. New Jersey is appealing; Christie said he would take the case to the U.S. Supreme Court. Still, Ortzman added, there’s also a plan to remodel the entire casino floor of Bally’s Atlantic City, giving the aging property a revised layout, new carpeting and the latest slot machines. Live gaming, he said, will always have a place in Atlantic City. Contact reporter Howard Stutz at hstutz@reviewjournal. com or 702-477-3871. Follow @howardstutz on Twitter.